When families are looking to move to a new area, they often consider the affordability of a new city, their new commutes and the quality of local schools. But one factor they can overlook is safety. More than just being crime-free, a safe city also has careful drivers and clean air. While danger can take an emotional and physical toll, a lack of safety can affect your savings account too. A bad accident or damage to your property can leave families tightening their budgets. In order to rank the safest cities in America, we looked at data on seven factors. Specifically, we looked at violent crime rate, property crime rate, traffic death rate, percent of workers commuting to work alone, the air quality, percent of residents who excessively drink and drug overdose mortality rate. Check out our data and methodology below to see where we got our data and how we put it together to create our final rankings. 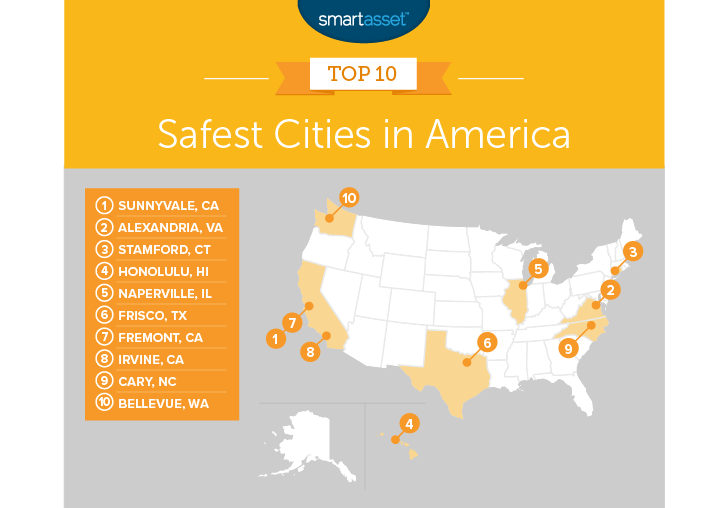 This is SmartAsset’s fourth annual study of the safest cities in America. Read the 2017 version here. Consistency at the top – All of last year’s top 10 cracked the top spots this year. However, there was some significant shuffling among the safest cities. Coasts tend to be safe – Eight of the top 10 safest cities in America were on either the East or West Coast. 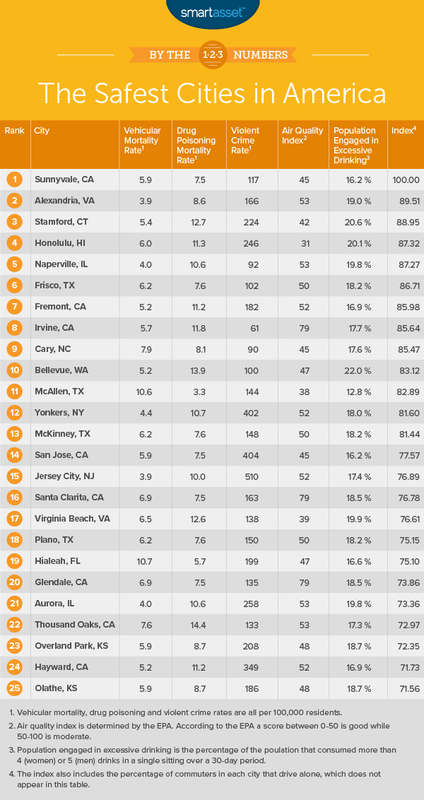 Once again, the data shows that Sunnyvale, California is the safest city in America. It is rare to see violent crime or property crime here. In each of those metrics, this city ranks in the top 25. Along with that, the roads here are also some of the safest in the country. Sunnyvale has a motor vehicle mortality rate under six per 100,000 residents. For that metric Sunnyvale ranks 33rd. Perhaps most importantly there is nothing one needs to be concerned about safety-wise while living in Sunnyvale. The city ranks in the top half in every metric. Taking the second spot is the safest city in the Washington D.C. metro area. Alexandria residents are mostly safe from the threat of one of the biggest killer in America: vehicle accidents. Alexandria ranks fourth in traffic death rate at under four per 100,000 residents. In more traditional safety metrics related to crime, Alexandria also scores well. In both property crime rate and violent crime rate, Alexandria ranks in the top 20. Stamford, Connecticut comes in third. This city is propelled up the rankings thanks to its low number of traffic deaths and low property crime rate. Few residents can rest as easy as those living in Stamford, Connecticut knowing their property is safe. This city has the 16th-lowest property crime rate in the country, according to FBI data. In total, Stamford ranks in the top half for all but one metric. To improve its score, Stamford may want to cut back on the drinking. Stamford ranked as the worst city in the top 10 for excessive alcohol use. Hawaii’s capital is a great spot to live. Of course, it is one of the most beautiful places in the country, but it is also one of the safest. First off, breathing the tropical island air will do your health no harm. According to EPA data, Honolulu has some of the finest air in the country. Traffic deaths and driving alone to work are also relatively uncommon in Honolulu. While Honolulu ranks in the top half for property crime rate, the city could look to improve that metric. Honolulu has the second-highest property crime rate in our top 10. Naperville is another city that has frequented this top 10. Last year Naperville ranked as the third-safest city in America. In terms of crime, Naperville is hard to beat. This city ranks fourth for both lowest violent crime rate and property crime rate. Unfortunately, Naperville falls to fifth because of poor air and fairly high rates of excessive drinking. In both of those metrics, Naperville falls outside the top half. Texas’ lone representative in the top 10 is Frisco. The city ranks in the top 15 for both of our crime metrics, including sixth for violent crime rate. Along with the low incidents of crime, drug overdose deaths are fairly rare in Frisco. Specifically, Frisco has a drug overdose mortality rate of 11.2 per 100,000 residents, the second-lowest in our top 10. Frisco falls to sixth, though, because of a large number of commuters driving to work alone. Lots of drivers on the road driving alone creates a higher chance of accidents and less clean air. 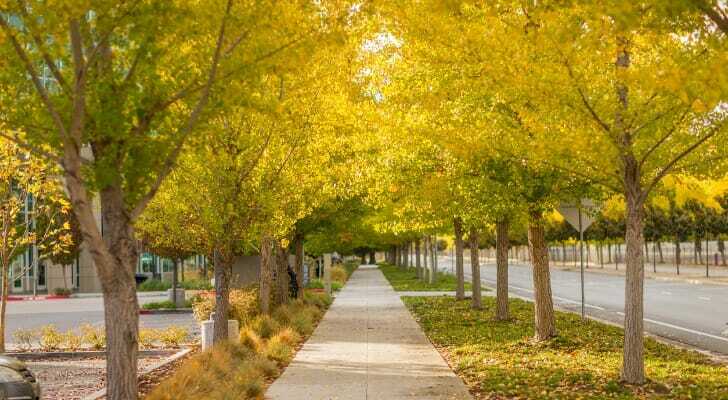 Maintaining its streak of top 10 finishes in this study, Fremont this year is the seventh-safest city in America. Fremont is fairly safe across the board with low rates of vehicle-related deaths, property crime and violent crime. Fremont does not score as well in drug use, excessive drinking and air quality. If we were assessing the safest cities purely on crime metrics, Irvine would surely rank higher. This city has the lowest violent crime rate in the study and the seventh-lowest property crime rate. Along with the low chance of crime, residents in Irvine are also not likely to die in car accidents. Irvine has the 20th-lowest vehicle mortality rate. Irvine tumbled to eighth due to fairly poor scores in excessive drinking and air quality. Cary is another city used to reaching the heights of the top 10 safest cities in America. This year is no exception. Cary combines low violent crime rates, low property crime rates and low drug use to take the ninth spot. For crime, in particular, Cary stands out. It ranks in the top three for low rates in both property and violent crime. Commuters and high vehicle mortality rates make Cary less safe than it could be. In both those metrics, Cary ranks around average. Finally, our list wraps up in Bellevue, Washington. This city is distinctive in that its low crime metrics are not very well correlated. Typically the violent crime ranking and the property crime ranking are similar. However, Bellevue ranks fifth in violent crime rate and 86th in property crime rate. The odds of dying in a vehicle accident in Bellevue are also among the lowest in the country, adding to the safety of the city. Bellevue ranks 12th with a vehicle mortality rate of 5.18 per 100,000 residents. Violent crime rate. This is the number of violent crimes per 100,000 residents. Data comes from the FBI’s 2017 Uniform Crime Reporting Database. Property crime rate. This is the number of property crimes per 100,000 residents. Data comes from the FBI’s 2017 Uniform Crime Reporting Database. Vehicular mortality rate. This is the number of deaths due to traffic accidents per 100,000 residents. Data comes from countyhealthrankings.com. Drug poisoning mortality rate. This is the number of drug poisoning deaths per 100,000 residents. Data comes from countyhealthrankings.org. Population engaging in excessive drinking. This is the percentage of adults who consumed more than four drinks of alcohol for women or five drinks of alcohol for men on a single occasion over a 30-day period, or who engage in heavy drinking, which is defined as drinking more than one drink per day for women or two drinks per day for men on average. Data comes from countyhealthrankings.org. Air Quality Index. This is a measure of air pollution in each city. The Air Quality Index data comes from the Environmental Protection Agency. A lower score is better. Air quality data is from 2017 and does not reflect any changes from the California wildfires of 2018. Commuters driving to work alone. This is the percentage of the workforce that gets to work by driving alone. The data on the percentage of commuters who drive to work alone comes from the U.S. Census Bureau’s 2017 1-Year American Community Survey. First, we ranked each city in each metric. Then we found each city’s average ranking, giving a half weight to excessive drinking rate and drug overdose rate, and a double weight to violent crime rate. Using this average ranking, we created our final score. The city with the best average ranking received a 100. The city with the worst average score received a 0. Make sure you are insured – You may look at your monthly budget, see that various forms of insurance – home, car, health – and decide you can increase your savings rate by not having insurance. While this may work out in the short term, odds are you will end up paying for this choice down the road. A car accident that leads to an injury could leave you paying out of pocket for not only the cost of your car but also your injury — not to mention the the expense of the work you miss. That could have a catastrophic effect on your finances. Use the right savings account – If you are banking with a traditional financial institution and using its generic savings account, you’re probably not maximizing the growth potential of your money. Online-only savings account at banks like Ally and Synchrony have APYs significantly higher than what you kind find in brick-and-mortar outlets. Get an expert opinion – No matter your financial situation, managing your finances is stressful. From juggling the monthly budget to wondering how much to set aside for retirement, any wrong turn in your personal financial plan can lead to setbacks. So why not take the advice of an expert? A financial advisor can make sure your money is working for you. If you are not sure where to find a financial advisor, check out SmartAsset’s financial advisor matching tool. It will match you with up to three local financial advisors.